After covering your table and while cutting the top off of your pumpkin in jack-o-lantern-making fashion, start asking your kids questions. How do pumpkins grow? Do they grow from a seed? From a tree? In the wild? Then move on to other questions like is this pumpkin solid? hollow? 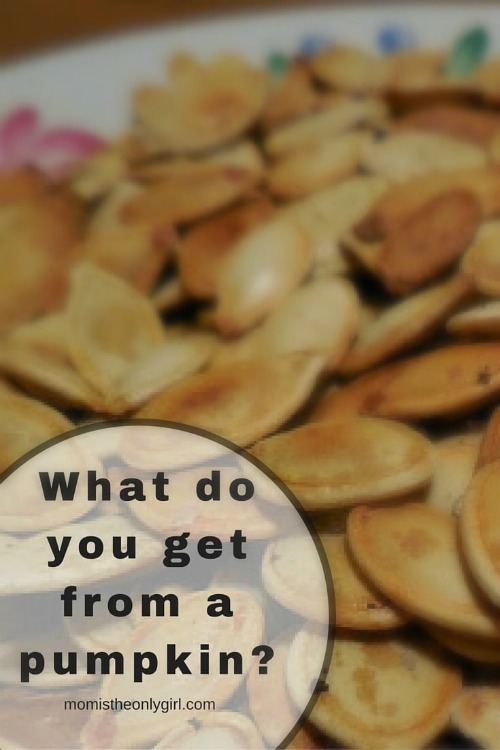 what are the parts of a pumpkin (flesh, skin, seeds, stem)? Once your pumpkin is open scoop out the insides. My boys loved to get their fingers in there grabbing huge amounts of seeds, but didn’t stay at it for long (it got too goopy). This was when I asked them why it was so goopy inside! While the kids get distracted with another adult creating their jack-o-lanterns, try to clean off the seeds the best you can after putting some water on to boil. This is a little challenging, but try to get to the point where you only have seeds, no stringy stuff. This is where the strainer comes into play. Rinse well! Once the seeds are clean, its time to brine them! By now my kids started taking breaks from watching Hubby make the cuts based on the pictures they drew for their jack-o-lanterns and occasionally joined me at the stove. Measure out the seeds. For every cup of seeds you will need 1 tablespoon of salt and try for a generous amount of water, about 2 cups for each cup of seeds. The boys were super helpful with this and its a chance for some sneaky math. We talked about what the salt water might taste like (they dipped their fingers into some I made on the side) and why we are ‘brining’ the seeds, what the saltwater might be doing to them, and whether they will taste salty from this step alone. We also observed what the seeds looked like and predicted what they might look like after the 10 minutes of simmering on the stove was done. When the 10 minutes of simmering in the saltwater is up, strain the seeds, then carefully spread them onto a few paper towels to dry. You could probably skip this step, as moist seeds will give your seasonings something to stick to if you don’t want to use olive oil. But set a couple aside for your kiddos to do the touch and smell test with. Do you think it was different than before they were brined? Then spread the seeds onto cookie sheets, drizzle them with olive oil, crack pepper or dash whatever seasonings you’d like over them and push a few aside. Those few without salt are our control group, then lightly salt the rest. Try to make a single layer of seeds. Place the cookie sheets into a 325 degree oven for about 10 minutes. Give them a little stir, then pop them in for another 10 minutes or so. Watch for the last 5 minutes so they don’t burn! Maybe even pull a couple out, let them cool and crack them open to make sure the seed inside isn’t burning. Give them a taste test, they may need a few more minutes to get crispy! You want them a nice golden brown. When you pull them out dash a little more salt and seasonings over them if you’d like! 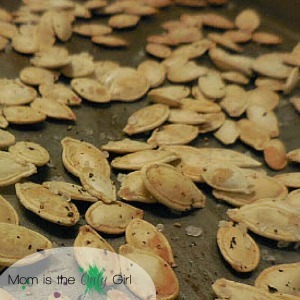 While your seeds are cooling, find those few you didn’t salt and set them aside for your taste test! Grab a few seasoned seeds, your unsalted seeds and your kiddos. Do a taste test comparison and describe your results! 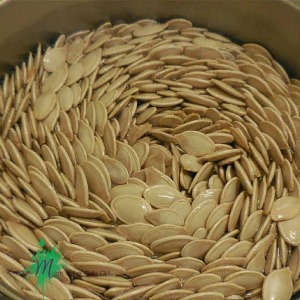 Enjoy your delicious, fresh toasted pumpkin seeds! After all, that’s what you get from a pumpkin! To download just this recipe (which is a conglomeration of about 5 different recipes or more from old cookbooks and hand-scribbled notes from grandmothers) click here. To download a printable with the science-experiment parts added in a much more reader-friendly format, click here!